After what amounted to a fairly gentle introduction to life in English football for new head coach Thomas Christiansen he is now aware of what lies ahead for him and his Leeds United team. The Whites fairly breezed through their opening EFL Championship game at Bolton and their first round Carabao Cup tie at home to Port Vale, scoring seven goals and playing some decent football along the way, outclassing their opponents indeed. But it was a different story last Saturday when a much more battle hardened Preston team came to Elland Road determined to put a dent in United’s oh so positive start to the campaign and went away as the first team to deny Leeds victory with a hard fought goalless draw. In front of almost 33,000 they played their party pooper act well. They were skilled in football’s dark arts and chased everything down, making life as hard as possible for a home side looking to entertain, but unable to shake off the shackles for much of the game. Life in the Championship could not have been better highlighted and maybe this was just the eye-opener the new boss needed. He saw again how tough the competition is when Fulham came to Elland Road and played the home side off the pitch for the first half-an-hour or so before the Whites began to close them down better and in the end were well worth the point they gained, admittedly in disappointing circumstances with a second goalless draw in four days. Contrasting opponents, the same result, but enough evidence to say that Leeds are going to be competitive this season wherever they end up position-wise. But they do need to start games better and Christiansen will be hoping his players are learning some valuable lessons for the battles to come. The head coach insists he was aware of how tough it would be in the league he has come into. After the Fulham game he said: “It’s another clean sheet and I believe the team played a very good game. “We have to recognise that we played against one of the best teams in this league. They started very well and we were not fast enough. “At the end of the first half we controlled the game a bit more and in the second we deserved more. 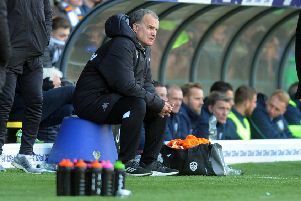 Leeds are on their travels for the next two league games, first up in a game against a Sunderland side beginning to shape up better under former Whites boss Simon Grayson following relegation battles in the Premier League in recent years. With two wins and a draw so far they are looking like being one of the promotion contenders and will be another big test of how Christiansen’s side is shaping up. The Leeds boss has probably has not found his best starting 11 yet after playing a virtually completely different line-up in the Carabao Cup tie to the three teams that have started the Championship matches. He has welcomed the competition for places he now has, but the drawback of that is it being difficult to work out who the starters should be. For instance, who are the best wingers? Should Saiz be given a regular starting spot in the number 10 role? And who should the two central midfielders be with six competing for the two shirts? The head coach will have hoped to have worked out more answers from last night’s game against Fulham, but he is not being given much time for thought with the matches coming thick and fast and another Carabao Cup tie coming up next Tuesday against Newport at Elland Road.